In Portland, Maine, a local Quaker group has escalated the occurrence and methods during their nonviolent protests, resulting in greater participation and impact of their campaign against organizations contributing to climate change. Many utility companies and banks have been forced to make pro-climate changes by sustained nonviolent campaigns. Nonviolent campaigns spread through word of mouth, social media and dramatic actions of civil disobedience. What we found at Earth Quaker Action Team was that a series of actions escalated over time combines both personal expression and the satisfaction of making an impact. 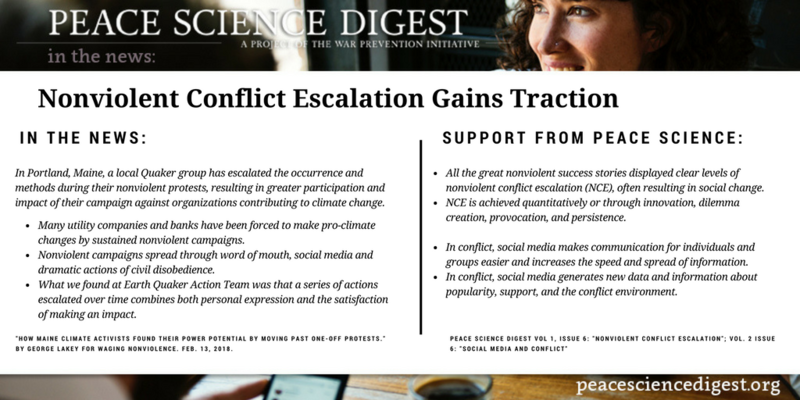 All the great nonviolent success stories displayed clear levels of nonviolent conflict escalation (NCE), often resulting in social change. NCE is achieved quantitatively or through innovation, dilemma creation, provocation, and persistence. In conflict, social media makes communication for individuals and groups easier and increases the speed and spread of information. In conflict, social media generates new data and information about popularity, support, and the conflict environment. “How Maine Climate Activists Found Their Power Potential By Moving Past One-Off Protests.” By George Lakey For Waging Nonviolence. Feb. 13, 2018.